Zijn merk Angulo Boards, lanceert in 2013 een nieuwe collectie surfplanken samen met een vernieuwd distributienetwerk. Dit zal de nodige inspanningen met zich meebrengen terwijl Josh slechts beperkte tijd heeft om een nieuwe samenwerking aan te gaan voor de competitie van 2013. Die geruchten over zijn contract konden weleens waar zijn. Vorig jaar had hij hetzelfde bij GUN, in september gooit hij zijn nieuwe voorwaarden op tafel. Zo heeft hij nog genoeg reactietijd in het geval ze er niet uit komen. GUN heeft destijds heel lang niks laten horen en daardoor is hij lastminute bij P7 binnengevist. Waarschijnlijk voor niet al teveel knaken. Nu heeft Josh zich weer verbeterd (van 9e plek naar 6e plek) en vindt hij, terecht, dat hij betere voorwaarden kan vragen. Zoniet, stuurt hij snel aan op een breuk zodat hij genoeg tijd heeft om bij een andere renstal in the picture te komen.... Slim! 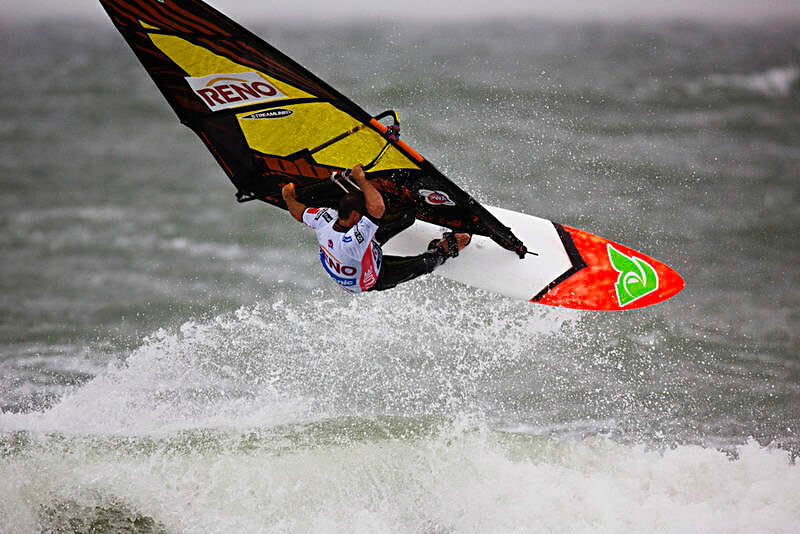 Josh Angulo (CV-1) had a great Slalom season, finishing the 2012 PWA Slalom tour on the 6th place. He even won a final in Alacati. But will we see him competing on the PWA Slalom tour in 2013? After being only one season on the “black sails” and great results on the Slalom course he leaves his current sailsponsor Point-7. took a flight back from Turkey to Boston two days before the start of the PWA event to pick up the slalom fins, he had forgotten at home. It´s Aerial time. Josh a few days ago on Sal, Cabe Verdes (Pic: Angulo). C7: Hi Josh, you are actually at your homespots on Sal, Cape Verde. How is it to be back on the island? 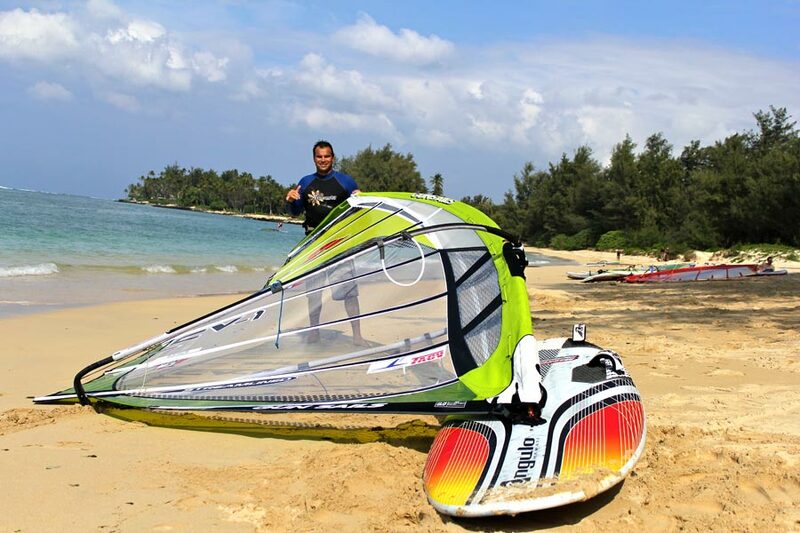 Josh Angulo: Actually I was just in Sal for 2 weeks doing a bit of work on the beach club and got some wavesailing. I definitely appreciate the wave sessions, as it’s so rare that I get to wavesail nowadays, so I had a lot of fun cracking a couple lips. I’m back in Boston for my second son’s birth, any day now, and probaby get back to Sal as soon my wife gives me the “green light”. C7: We heard you are going to leave Point-7. Is that true, just after one season? Josh Angulo: Yes, it’s just how it goes. C7: What’s the reason for that decision? You had a great result in the overall PWA Slalom ranking, 6th overall. You left MauiSails, Gun Sails and now Point-7, too. The 4th change within 5 years! Why is it so hard to find a long term relation with a sailsponsor nowadays? Josh Angulo: From my understanding, the team budget they do have is preferred to be spent on a younger team. I believe they have some new “young guns” that they will by announcing soon that have joined the team. (Editor’s note: We know, that Maciek Rutkowski and Bora Kozanoglu joined the Point-7 team so far). So there was no budget for me. Yes, 4 changes in 5 years. I could have stayed with all of them if I was willing to more or less work for free, but it’s just not possible. I don’t come from a “trust-fund” background, so I need to actually get paid for whatever line of work I do. I don’t begrudge any of my ex-sponsors…. contrarily, I thank and appreciate the different supports I have had through the years. I have worked with strong companies that have invested directly into my family’s well-being. I understand well, that professional windsurfing is not a “right”, it’s a “privilege”. Those of us, who have chosen to pursue this line of work have also chosen the risks that come with it (i.e. unemployment). Before leaving any of my previous employers, I’ve always tried to balance out, if it was feasibly possible to travel the tour, and support, in part, my family from professional windsurfing. When the math becomes super clear that it’s not possible than I have no choice but to walk away. Trust me, it’s never easy to walk away. Josh gives it all on the racing course. 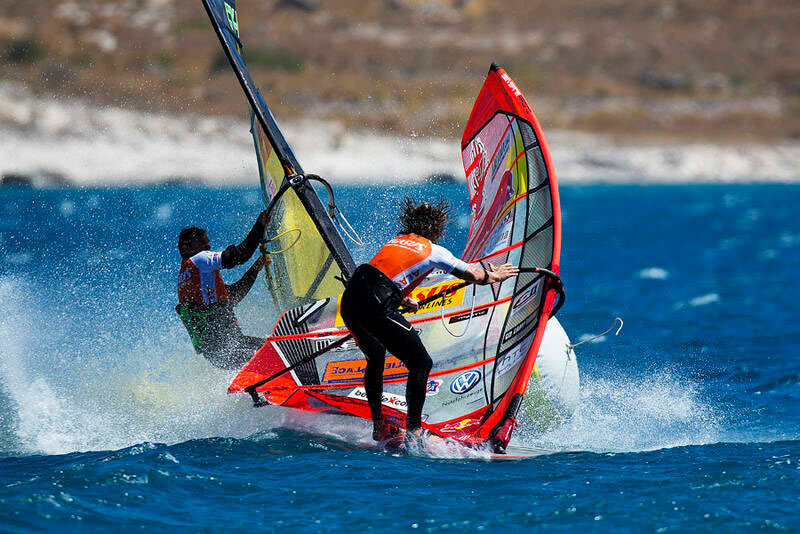 This time at Alacati 2012 (Pic: PWA/Carter 2012). C7: It looked like you were an active part in a fresh team, which had a motivated company chief, a marketing manager at several events plus a video/photographer. Wasn’t that wonderful and the reason for your great performance on the racecourses? Josh Angulo: Yes, it was a pretty sick and exciting set-up and the sails are real fast and yes, all that played into me having some decent performances. I believe there was a pretty exciting dynamic and it would have been exciting to see where we could have taken it to. C7: Which sailbrand will you use in 2013? Josh Angulo: Good question. Once again…. professional windsurfing is a special privilege. I’ll do it while the doors are open and if the time comes for the doors to close, I know full well God has an even more exciting plan awaiting for me. My heart is still in the game more then ever before, and in big part, thanks to the Point-7 team, who gave me a shot of energy last year and I got to see some flashes of my slalom potential even clearer than before. For now, I can just use this time to get myself fit and ready, work on other on-going projects and take advantage of time with my family. C7: Last year, it was the same situation. You announced the collaboration with Point-7 in the middle of March this year. Is there the still enough time for you to get tuned? No brand feels the same. Josh Angulo: If I get with a brand, I’ll tune them, go fast and have good results. In the meanwhile Josh is working in his boardbusiness (Pic: Angulo). C7: What are your personal goals for 2013? You are 38 years old and you almost made it in the top 5 in the Slalom. Plus you got your Angulo production board brand running again. Josh Angulo: Not sure. I’ve really set any personal goals, besides staying focused on Jesus, keeping my wife happy and trying my best to let me kids know that I love them and try and raise them in a good fashion. My experience tells me that if I pursue all those goals, all the other things fall into place in a most exciting and positive fashion. The Angulo board range for 2013 (Source: Angulo). C7: Will you continue to live in Bosten with your family? C7: Any participation in wave events planned? You for sure were not too happy about the 25th place in Sylt this year? Josh Angulo: You never know.. It’s hard to get rid of that “competition bug”. Maybe an event in Hawaii or CV. I had a lot of fun in Sylt. Actually I wasn’t dissapointed as basically my goal was not to embarass myself. I lost to Kauli and Peter Volwater, who are both awesome sailors and I believe they sailed strong against me. I had decent heats, nothing extraordinary, but I had some pretty strong free-sailing sessions in Sylt, that boosted my morale and kept a smile on my face. C7: Where will you prepare for the 2013 PWA season? Josh Angulo: Boston… wicked pissah! C7: Thanks for the interview and good luck for 2013! 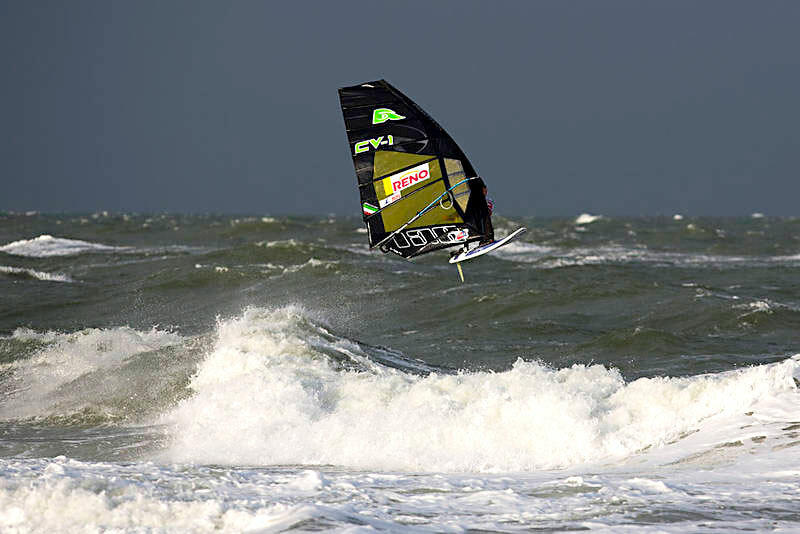 Angulo style at Westerland, Sylt 2012 (Pic: PWA/Carter 2012). In few years, it has been a lot of changes, I know, there was MauiSails for 2 years that we have won the world title in waves. I kept good relations with Phil McGain and Barry Spanier and I always greatest respect for them. then there was Gun Sails then with a history far more complicated than I would have thought. away If I that these are people who do not windsurf, their understanding and dynamic compared to windsurfing is limited, and I had no other choice but to leave. Pour Point-7 is simply a matter of economic reality. But I think everyone has benefited from this collaboration as I have also benefited from budget support and thus continue to go round the world. Going forward, here I am again at the starting point as last year. I am ready physically and mentally and see how things will evolve in the coming weeks. novelty for me, this is the side of Angulo Boards. When the distribution with Gun Sails stopped, they were very aggressive on price and I'd better make low profile and do not release new products until it passes. 2013 is the opportunity to start with a new collection especially strong collaboration with Pieter Bijl who has a perfect knowledge of the sport market after all these years of NeilPryde for work. It is his energy and enthusiasm that motivated me to go back in this adventure and the goal now is to return the product and only product to make an authentic brand Angulo Boards "
Mooie foto's van nieuwe ontwikkelingen mbt het achterlijk. Wat een fantastisch goed nieuws is dit! Leuk , nu nog hopen dat ze de problemen waardoor ze vorige keer uit elkaar zijn gegaan weten te vermijden. Wel een mooie windsurfboards heeft hij nu in de slalomafdeling staan. Zouden ze ook terug gaan samen werken Gunsails en Angulo op het vlak van het verdelen en verkopen van de boards ? op kop in Sylt na 3 racedagen!